BreWingZ Sports Bar and Grill opens its second location in the San Antonio area. The new restaurant marks the 23rd grand opening for the chain. BreWingZ Restaurant and Bar opens its second location in the San Antonio. Located at 5630 Walzem Road, the family-friendly restaurant chain launched its 23rd location with a grand opening on November 16th. Based in Houston, Texas, BreWingZ is excited to extend its reach in San Antonio and share its love of bold flavors in a variety of menu options that are sure to please all crowds. In a 6,000 sq. ft. building and 1,000 sq. ft. patio space, this location is perfect for family and friends to enjoy a variety of menu items, daily specials and huge high-definition TV’s to cheer on your favorite teams. From house made appetizers, to delicious burgers and fresh salads, the menu offers something for everyone! “We welcome you to experience what our customers love the most, great food that’s always fresh and made to order,” said Vice President, Robert Snelson. Famous for their “Two for Tuesday”, BreWingZ offers daily specials that allows guests the opportunity to enjoy their tasty menu in a wallet-friendly way. With many options to choose from, the chicken wings continue to be an All-Star choice. Always crispy on the outside, tender on the inside, the hardest decision to make is which of the 20 plus flavorful sauces you will try first. 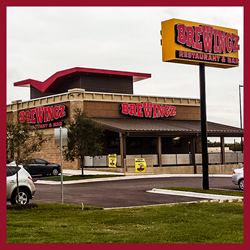 While the dine-in experience is where you’ll find mouth-watering food paired with welcoming service, BreWingZ also offers convenience with online-ordering and take-out orders.To find more information on daily specials and a BreWingZ location near you visit them online at http://www.BreWingZ.com.